There’s a legend among the Aymaran people of South America that tells of a massive salty lake formed from the tears of a giant goddess named Tunupa. 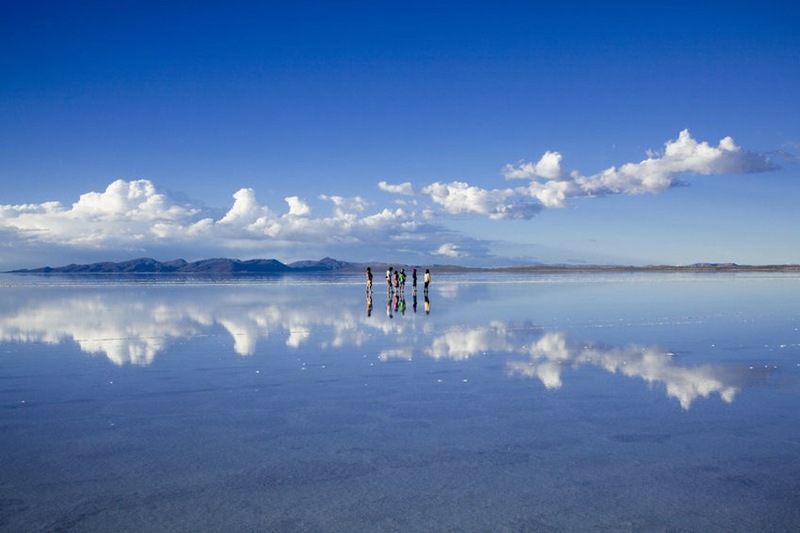 Legend has it that the lake of Tunupa’s tears eventually dried up, creating the world’s largest salt flat –– which looks like the world’s largest mirror. Scientists explain the Salar de Uyuni (the Salt Flat of Uyuni in Spanish) in a slightly different way. It was created, they say, when a prehistoric lake –– one between 30,000 and 40,000 years ago –– dried up and left a vast layer of salt. Sorry Tunupa but we’re leaning toward the scientific explanation. The Salar de Uyuni is a plateau near the top of the Andes mountains in Bolivia, South America. It’s so incredibly flat that when it rains, a layer of water covers the salt flat and mirrors the sky so perfectly that it’s impossible to tell where sky ends and land begins. This giant mirror (we’re talking huge) is in fact the largest mirror in the world, spanning over 4,000 square miles. Check out the amazing photo above and some fascinating salt facts below.